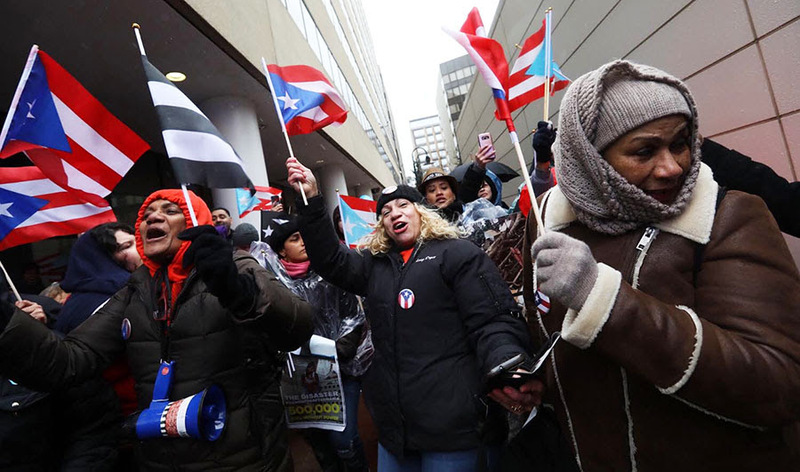 During the week of April 20, the CPD Network organized a set of actions focused on impacting federal housing policies for Puerto Rican families living in the US. These actions came at a crucial moment as FEMA threatened to cut funding for hotels vouchers for Puerto Rican refugee families affected by Hurricane Maria and the Puerto Rican government did not request an extension. CPD affiliates involved hustled to organize over 10 actions happening in one week. Affiliate Organize Florida led the way with more than six actions, member meetings with elected officials and intense lobbying in Orlando and Kissimmee. Make the Road in Connecticut and New Jersey held local lobby days to support local and nationwide legislation on housing. In New York, Make the Road New York and New York Communities for Change (NYCC) showed up at city hall to demand FEMA continue supporting refugee families. Finally, Make the Road Pennsylvania held actions in Allentown and Reading to advocate for families in their communities. Thanks to the advocacy of our partners, FEMA granted an extension for housing vouchers until June 30. This extension will support thousands of refugee families in the US still struggling to recover from Hurricane Maria. In May, our partners will begin a "Summer for Puerto Rico" campaign to engage Puerto Ricans living in the US to use their political power to fight for the rights of Puerto Ricans on the island and on the mainland. If you’re interested in getting involved with the Summer for Puerto Rico, please contact Julio Lopez.